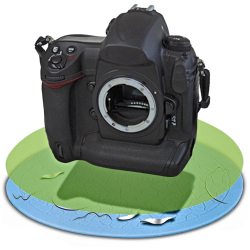 Dust Snapper — clean camera body, lense environment, removes dust. 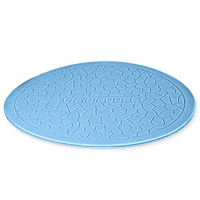 Dust Snapper™ provides Ultra-Clean surface for critical cleaning™. 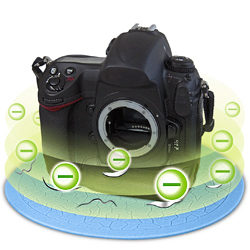 Using ionic and enhanced magnetic action of Dust Snapper™ ,one can provide an Ultra-clean camera/lense environment.The combined ionic and magnetic action of Dust Snapper™ removes and locks the dust particles from contact area of camera or lens. Most camera bodies or lenses are made of composite materials which are prone to dust and particles attraction when placed on ordinary surfaces. These contaminants once attached to the body of the camera, finding their way inside the camera or lens, eventually landing on the image sensor. In order to combat this problem, VisibleDust has created a special polymer pad with dual ionic and magnetic action called DustSnapper™. Dust Snapper has a higher affinity to dust than the camera body or lens itself. Once a clean DustSnapper has been placed under the camera body or lens, it creates a clean environment at the same time using its dual ionic and magnetic action to remove harmful contaminants away from the lens or body of the camera. This creates a safe and mini clean environment for camera or lens to be placed on. DustSnapper™ is easy to clean, simply place it under running water and let it air-dry or blast it with canned air to rid of contaminants. One added bonus DustSnapper™ provides a smoother surface in addition to clean environment to prevent shock or dent. A clean DustSnapper™ could be used as mini clean environment for critical cleaning. Finally, DustSnapper™ is scientifically made to act as mini clean environment and should not be mistaken with ordinary plastic or silicon pads In stock! Order now!